From the creation of one-of-a-kind recipes to application of advanced technology in bread and pastry production, the country’s baking industry has gone a long way in terms of adapting to the changing times. And to help support the flourishing local baking industry, URC Flour and Pasta Division partnered with the Department of Education (DepEd) to co-create a toolkit that will guide teachers as they help aspiring bakers and pastry chefs be a step closer to their dreams. Senior high school students enrolled in the Bread and Pastry Production course, under the Technological Vocational Livelihood Track, are set to learn industry standards and practices about the basics of baking through multimedia materials. The toolkit features instructional videos, presentation materials, lesson guides, and rubrics about baking bread, pastries, cakes and other flour-based treats. These were collated by experts and culinary professors to ensure relevance and alignment to DepEd’s curriculum. URC Flour brands include Blend 100 Flour, Continental All-Purpose Flour, Daisy Cake Flour, FibrA+ Whole Wheat Flour, Globe First-Class Flour, My Rose Soft Flour, and Sampaguita Soft Flour. 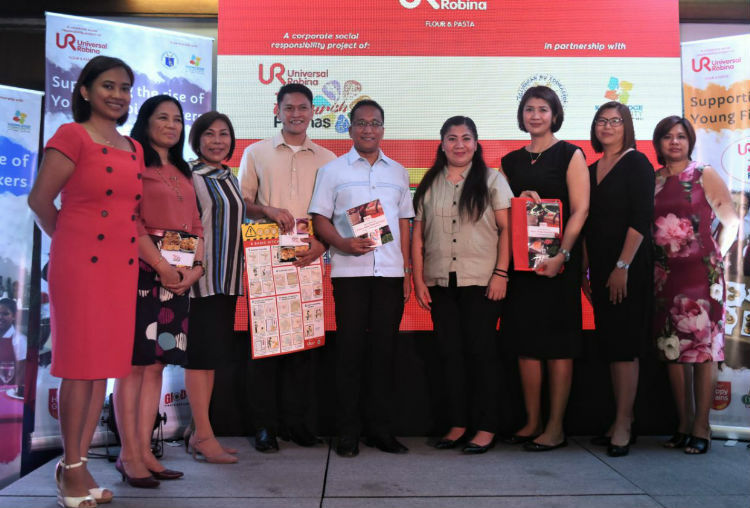 Universal Robina Corporation (URC) Flour and Pasta Division and Department of Education (DepEd) turn over baking multimedia toolkits to Sta. Lucia High School, represented by (fourth from left, to right) Angelo Dela Cruz, school principal Gilbert Inocencio, and Maria Jazzy Arañador. Photo also shows (from left to right) Knowledge Community’s Cecilia Ubarra, DepEd Central’s Isabel Victorino, DepEd Undersecretary Lorna Dig-Dino, URC Flour and Pasta Division’s national sales and marketing director Naida Ebora and marketing manager Ma. Lilia Andres, and JG Summit Corporate Affairs’ director for CSR and sustainability Yvonne Garcia-Flores.